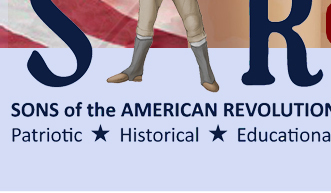 The National Society of the Sons of the American Revolution (NSSAR) is never tiring in its efforts to advance American heritage and the patriotic values our forefathers cherished so dearly. The NSSAR is currently in the midst of constructing a new Visionary Outreach Education Center, Museum Exhibits and National Headquarters in Louisville, Kentucky, which will bring an even greater dimension to those efforts. To fund this endeavor, the 1776 Campaign was created to accept donations from those who share our ideals of promoting Americanism. Each contributor to the 1776 Campaign receives a gift that is relative to the amount donated (please refer to the Donation Form link). To show its support of our National Society, the Board of Managers of the Piedmont Chapter has pledged a $1,776 donation to the 1776 Campaign, which will be paid over the next five years. I encourage each SAR member, and anybody else who wishes to support the advancement of American heritage to make a generous contribution to the 1776 Campaign. Your generosity will help us continue in the spirit of those patriots who gave everything to assure our freedoms. The Piedmont Fellow Fund was established for the purpose of funding, supplementing or reimbursing worthy activities, events, or needs of the chapter that are not included in the annual budget. The Fund is in honor of General Nathanael Greene, who was instrumental in recapturing the South from the British in the Revolutionary War, and who lived in Georgia after the war and is buried near Savannah. Any member of the SAR, friends, relatives, spouses, or other individuals, living or deceased, having an interest in furthering the goals of the Piedmont Chapter, or that are being recognized or memorialized, may become a member the Fund with a contribution being made in their name for the required minimum amount. 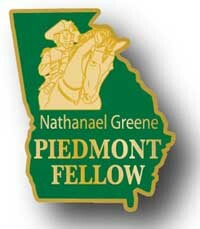 Those who are so named shall be designated a "Piedmont Fellow" and be awarded the distinctive "Piedmont Fellow Fund" pin which identifies them as a "Piedmont Fellow." Wearing of the pin which identifies one as a "Piedmont Fellow" connotes support of the ideals of the Piedmont Chapter and the National Society of the Sons of the American Revolution and provides a tangible source of identity and pride to the wearer. A minimum contribution of $100 is required. Contributions will be acknowledged by a letter from the Chapter President. A contributor may designate themselves or designate another person a "Piedmont Fellow," but just one pin will be awarded for each $100 contribution.